When it comes to driving laws, we are faced with so many things that people are not aware of. New laws do tend to appear every few months and it is difficult to learn all that happens, especially after you get your license. It is quite normal to end up not knowing what is new and what new laws have to be respected. 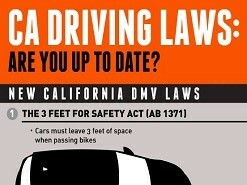 With this in mind, infographics like this one about the CA driving laws that recently appeared should be considered at all times. All that you really need to do is take a look at all the information that is offered in the infographic. As a very simple example, did you know that you are obliged to maintain a specific distance from a bike as you drive a car? This is something that most people out there had no idea about. It is the type of law that can give you a quick fine since you know nothing about it and it is possible that you can hurt a biker in the event that you do not respect it so it is quite useful. The truth is that you will also take a look at some laws that are known by you. For instance, the one that is connected with texting while driving. However, we are 100% sure that you will not be aware of most of the laws that appear in this infographic and that now actually exist in California. Safe driving is really important. You have to always be sure that you know the law and that you stay up to date with all those that appear. This is not only important for you and you driving record, although the insurance premiums that you end up paying when you are caught breaking the law do tend to go up really fast. The main reason why you do want to know the newest CA driving laws is to protect those that drive near you and your passengers. Do not waste more time and do take into account all that is presented in the infographic. You will quickly appreciate absolutely everything that is highlighted below.